Farm Profiles — Ottawa C.S.A. At Ferme Pleine Lune we are committed to growing high quality, certified organic vegetables, herbs and flowers, while maintaining a primary focus on ecological sustainability and soil improvement. You can find our produce through our Community Supported Agriculture programs or at the Wakefield Farmers Market! This workers' cooperative farm has recently taken over the land on Davidson Side Road once occupied by Riverglen Farm. The site is conveniently located in the Greenbelt near Kanata. You will be able to pick up your veggies at the farm gate. Ekoroot Farm is owned and managed by Melanie, her husband Ianik and their three children - Jay, Ashton & Amabella. Here is where we manage 30 acres situated on NCC land in Ottawa's Greenbelt. We only practice organic growing methods by following the Canadian Organic Standards. Bower Farm (est. 2013) is a Non-Certified Organic Farm located in the outskirts of Ottawa, Ontario in North Gower. The focus of the farm is to provide high quality, nutrient dense produce to our customers. We’re Luke and Dana! Consciously growing delicious and nutritious, non-certified organic vegetables! With years of experience in the restaurant industry our love of food brought us out of the city and into the country. Our farm is located in Burnstown just 50 minutes west of Ottawa. We have adopted bio-intensive farming practices, using mostly hand operated tools on just over an acre of land. Each year, we produce over 30 varieties of vegetables providing for our CSA program, restaurants and markets. We want you to ‘grow with us’. 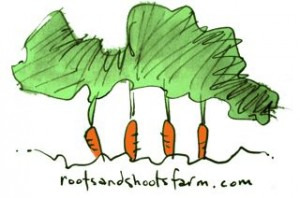 With their new digs in Masham, Roots and Shoots continues to offer their veggies across the city. You can also find them at the Ottawa Farmer's Market at Lansdowne and Westboro. Located in the township of Ange Gardien, Quebec, this little farm has lots of options in the Ottawa area. Please note that this farm is registered with Equiterre and requires a small membership fee. This farm, tucked into the hills near Chelsea, Quebec, serves just the New Edinburgh area on the Ontario side. Richard and Charlotte are charming and will keep you well supplied. Please note that this farm is registered with Equiterre and requires a small membership fee. Located in the lovely township of St-Albert, Luxy Farm offers a drop-off in Rockliffe Park, Sandy Hill and at the farm in St-Albert. You can also find them at the Ottawa Farmer's Market at Lansdowne Park or the Westboro Farmer's Market. Certified organic with Eco-cert. Located on an 80 acre farm 8km outside of Perth, Waratah Downs has been a longtime presence at farmers' market in Ottawa and has several drop offs available across the city. Pro-cert certified organic. Drop off points in the Market, on Beechwood and Old Ottawa South. This farm is a member of Equiterre and requires a small membership fee. Registered organic with Quebec Vrai. Multigenerational farm that had been providing Ottawa with veggies for decades. The Rochons have drop offs right across the city or you can catch them at almost any farmers market in the city. Don't want to limit yourself to veggies, try a Whole Farm CSA. When you sign up with Funny Duck, you get a taste of the whole farm, including various cuts of meat, veggies, apples, etc. All their animals are raised without the use of soybeans. Bluegrass has the edge on winter veggies, with an innovative greenhouse system that uses radiant floor heating to produce food through the Winter. Check out their site to find out more, or better yet, sign up for their Winter CSA that runs October to February. The Vis Tree Farm CSA program offers both pick-up and delivery options, as well as flexible scheduling. We're a certified organic and permaculture farm located in North Gower (30 minutes from downtown Ottawa). We look forward to working with you! At Grazing Days, we sell quality grass-fed Angus beef to families who live in and around Ottawa. A closer look at our farm reveals that Grazing Days is about much more than grass-fed beef. It is about a philosophy for a more sustainable community and a world that we would like to live in. CSA options: Home delivery of beef and pork. Many delivery options available.